Little Athletics is a uniquely Australian modified athletics program for children from 5 to 16 years. It is based upon the sport of athletics (track and field). There is a wide range of events from running, jumping, throwing and walking and events are modified to suit the age, developmental stage and ability of the children. Corroboree meets usually run from mid to late October through to late March with a break from Xmas though to at least mid January. The season works around carnivals that are conducted by Little Athletics ACT and ground closures by the ACT government so they change slightly each year. During 2017 Little Athletics Australia announced changes to the age group structure for all Little Athletics competitions across Australia. These changes were introduced in the 2018-19 season beginning in October 2018. Age groups moved to a ‘calendar year’ age structure, the same that is used for School Sports, i.e. age groups will be based on the age an athlete is turning the year the season concludes (for 2019-20 this means the age you will turn in 2020). e.g. Athletes turning 6 during 2020 will be the U6 years group. Athletes turning 7 during 2020 will be in the U7 years group. Can my child try Little Athletics before joining? Yes. At the beginning of the season we have a come and try day in September. (Keep an eye on the website for the exact date). We also allow competitors to compete in one meet for free with permission from the Club President. Email info@corroboreela.com for more information. Every competitor is required to wear the Corroboree T-shirt with a registration number attached to the front, along with an age group patch. You receive this shirt as part of your registration. See the Uniform page for an example. We also have singlets, crop tops, shorts and hats which are available on the link shown on the uniform page. There are sample sizes available at the tent every Saturday morning. These are not compulsory for the Saturday meets but we do find athletes like to wear the Corroboree shorts when competing at the ACT Carnival meets. All athletes must were their registration number and age patch on their shirt at each meet to ensure we can record all results accurately. You will receive these in your registration pack at the start of the season. Registrations are completed online here. We also accept mid-season registrations after Christmas. Each season is confirmed once ACT Little Athletics set their rates. What events will my child be competing in? At Corroboree we offer the full range of events for our athletes, however we do progressively add events as athletes move into older age groups to ensure that the events are age appropriate (for example, high jump from U9’s, and javelin and triple jump are offered from U11s). Our U6 to U8 athletes participate in a special program called On Track, which offers a combination of track races (always the most exciting!) and games and activities designed to develop the core skills children will use for events as they get older (jumping, throwing, starts etc). We run a rotating program for our weekly meets. Programs for the forthcoming weekend are published on our website and Facebook page. We compete most Saturday mornings between October and March each year, starting at 8:45am (the children warm up whilst the committee chat to the parents about upcoming events) and normally finish around 10:30-11.00am. Where are the Corroboree Little Athletics Club meets situated? 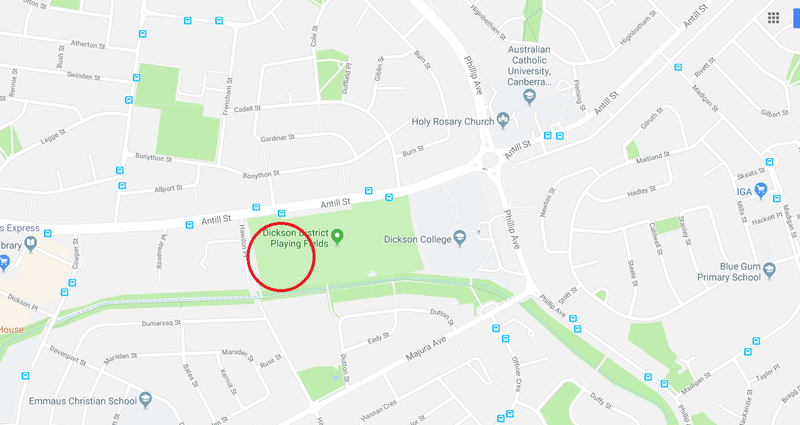 Our track can be found on Antill St on the far right hand side of the Dickson Ovals. Do I have to live in the Dickson area? No, Corroboree membership is open to anyone who is eligible to compete in the ACT. U9’s-U17s – Mondays and Wednesdays from 5.30pm during the season. U6-U8s – Wednesdays from 4.30-5.30pm during the season. Training is provided at no expense to club members and is not compulsory. Every effort is made to conduct regular competition meets but, due to safety concerns, events may be reduced or cancelled if the ground is wet and/or the weather inclement. An announcement of cancellation will be made as soon as feasibly possible on the morning of the meet via our Facebook page and website. Do I need to help at meets? We do ask parents to assist at meets. Each age group and gender requires an age group coordinator to assist with the smooth running of the meet for that group of children. The age group coordinator always needs assistance from other parents in measuring, recording, raking and general group control. Parents are asked to keep an eye on their children and address any behavioural issues that arise with your child. The age group coordinator is not a baby sitter. At least one parent or guardian of the child is required to be on site at all times during the meet. Why are athletes not allowed to compete with their friends in higher age groups? The events athletes participate in differ per age group, for example the distances they run change as they get older, and events like high jump, triple jump and javelin are not introduced until a specified age. Moreover, the weights of the throw implements and height and spacing of hurdles change with age. These specifications have been set by Little Athletics Australia and are based on the development stage of the children. Little Athletics Australia does not allow us to let athletes compete in higher age groups, as there may be liability and insurance ramifications, e.g. if we allow an athlete to use a higher weight implement or size of hurdles. During competition on Saturday morning, the committee and coaches try to ensure that the age appropriate weights, hurdles heights etc. are being used. It would be too confusing and difficult to monitor, if some children in a group would have different requirements than others. If children participate in LAACT carnivals, they would also have to compete in the appropriate age group. So, please encourage your child to be positive about making new friends in their appropriate Little Athletics age group. They will be able to catch up with their friends after the competition, as well as during the training sessions during the week. Can my child wear spikes to a meet? Athletes in the U9 – U10 age group may not wear spike shoes. Athletes in the U11 – U12 age group may wear spike shoes in events run entirely in lanes, long jump, triple jump, high jump and javelin. Athletes in the U13 – U15 age groups may wear spike shoes in all track events except walks. Spike shoes may also be worn for long jump, triple jump, high jump and javelin. All spike shoes must be worn with all holes filled with a complete set of spikes, with no more than two blanks/slugs installed. Spike shoes cannot be worn outside the defined “Field of Play” unless all spikes are suitably covered. What changes have been made to the rules this season?